Hidden between Avebury and Marlborough, Fyfield Down is a high plateau of chalk downland dissected by a system of dry valleys which contain one of the highest concentrations of sarsen stones in Britain, formed through lateral transport of the stones under periglacial conditions. It is well known that the acidic sarsen stones support an outstanding lichen community which is one of the best examples in north-west Europe. There are only six sites in England where sarsens are exposed (many others are buried) and three are near Marlborough. 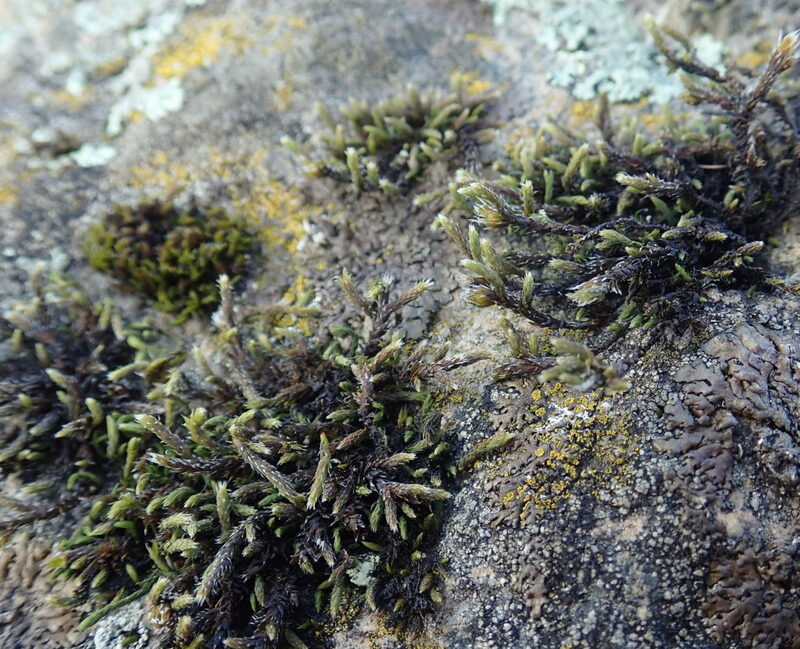 In the soft geology of southern England, sarsen stones provide almost the only exposures of hard, acidic rock and they support bryophyte assemblages representing species that are almost entirely restricted to the north and west. This assemblage was first described by Ron Porley in a paper in the Journal of Bryology in 1996. Fyfield Down is a particularly large site and to the public, is accessible only on foot, bicycle or horse from Avebury or Manton, both several kilometres away. Luckily the weather conditions were excellent for our visit and we’d made good time as we reached the edge of the National Nature Reserve. However, as we had special permission to visit the northern part of Fyfield Down, which is not within the NNR, we struck on. As soon as we reached our monad we started recording on occasional sarsens and numerous anthills. In this area we quickly found Pleuridium acuminatum, Polytrichum piliferum and, when Claire Halpin looked in a rabbit burrow, sterile shoots of Archidium alternifolium. Bryum subapiculatum was also noted on an anthill. 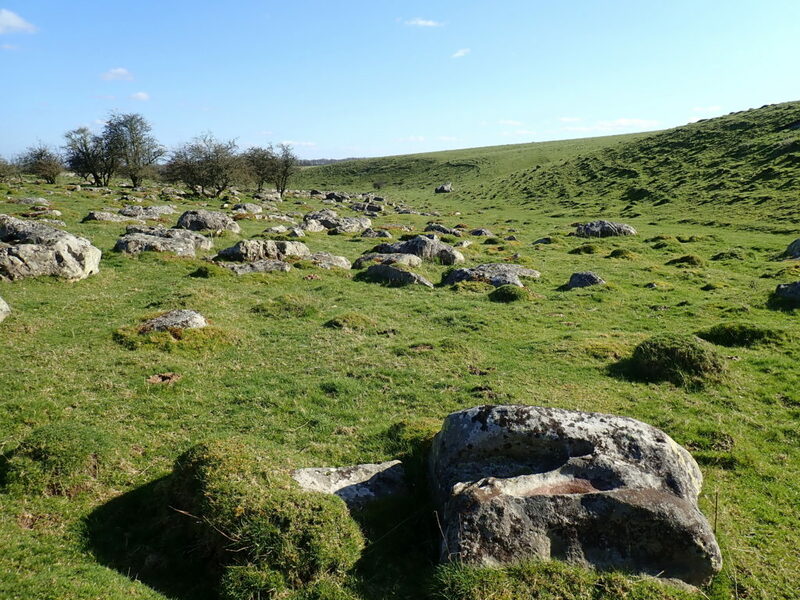 Although there were plenty of sarsens in a sheltered valley north of Delling Copse, they lacked any saxicolous specialities so we struck south, into the NNR and a spectacular long dry valley with numerous sarsen stones. Within a few metres of the woodland fence, Grimmia decipiens was found and admired, followed by Hedwigia stellata cfr. and Grimmia trichophylla. There was much discussion about whether the spinose teeth on the hair-point of G. decipiens could be seen with a lens but fortunately it was a larger, looser and hoarier plant than G. trichophylla or G. pulvinata, which also grew in the area. G. decipiens was subsequently found on numerous sarsens in the bottom of the valley, which seems to be a hot-spot for notable bryophytes, presumably because it is very sheltered. A little further on we encountered a few plants of the rare Hedwigia ciliata var. ciliata, also with capsules, looking very different to its more common relative when dry. We only found this species on one or two sarsens. 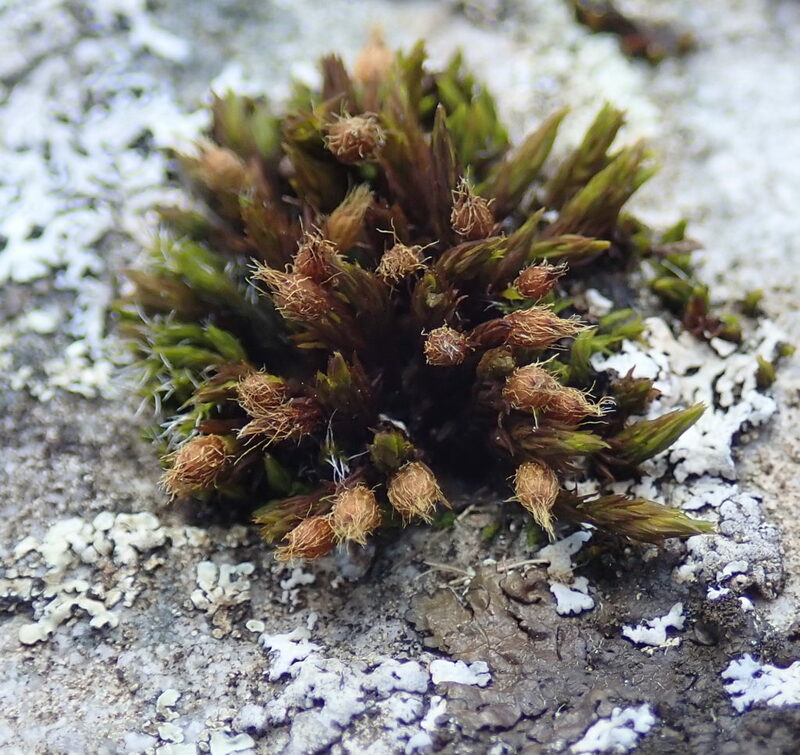 Equally rare was the gorgeous Orthotrichum rupestre, with its outrageously hairy calyptrae and handsome chestnut-coloured capsules. It was much admired and photographed. We carried on slowly down this valley, inspecting one sarsen after another. Marion Rayner spotted a lovely patch of Rhodobryum roseum, only reported once before at Fyfield Down in 1989. On a sarsen Andrew Branson found a small, dark and aromatic Frullania which puzzled us. Microscopic examination later confirmed it as F. fragilifolia (lacking its normal fugacious tendencies), new to Fyfield Down and last seen in VC7 in 1987. Frullania tamarisci and F. dilatata were also found on sarsens in the same area. Weissia brachycarpa var. obliqua has not been seen in VC7 for many decades and so was a welcome find on an ant-hill. Some of its capsules had dehisced, showing the diagnostic constriction around the peristome mouth, the lack of any peristome teeth and a membrane covering the mouth of the young capsules. The long walk back to the car park at Manton took a while but certainly allowed us all to reflect on the bryological and geological splendours we had enjoyed.